I'm sure you recognise this painting from my pictures and logos on social media, but I realised I should tell you all the story behind it. It has proved to be one of my most popular images, which is wonderful, considering it wasn't supposed to exist at all! 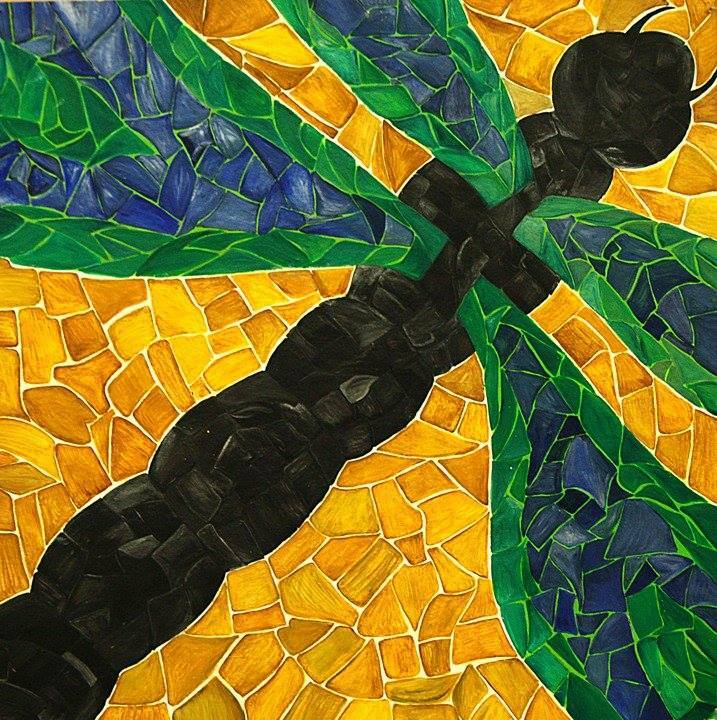 When I was doing my Art A-Level at college, I made a dragonfly mosaic out of broken glass and pottery. I was really pleased with how it turned out, especially how the blue and green glass shards made shiny dragonfly wings! Unfortunately, something went wrong. I don't know if I mixed the plaster improperly, or someone damaged it somehow, or what, but the day after I completed the project, I found it shattered! The plaster broke into a thousand pieces and I was devastated. To make things worse, we were being graded by an examiner in a couple of days, and there was no way I could re-do the mosaic in time. My art teacher suggested I do a painting of what the mosaic looked like instead, so I had SOMETHING to show the examiner when he came. So, I spent the next two days in a frenzy of painting, using the broken pieces of my mosaic as a guide. I used acrylic on card, and attempted to emulate the broken glass and pottery shards. It was unintentional, but the background ended up looking like parched ground or cracked mud, and made it seem as though the dragonfly was flying over dry ground. So the painting combined the elements of air and water in the dragonfly, with the element of earth below, and tied in with other projects that I had done, albeit as a happy accident!